(CNN) -- When President Obama took office, Democrats stood beside him in unity, but just as soon as Congress got to work, divisions in the party emerged. 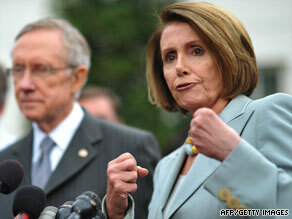 Infighting between Democratic leaders is "absolutely expected," Larry Sabato says. Now, nearly a year after the election, Democrats have little to show for this legislative session, despite holding a majority in both chambers of Congress. The Democratic leadership, most recently, has butted heads over health care, and, throughout Obama's term, the fiscally conservative Blue Dog Democrats have had a hard time swallowing the massive increases in government spending. "A lot of citizens and a lot of journalists think that government should be a smooth-running machine. There's never been a smooth-running machine called government," said Larry Sabato, director of the University of Virginia's Center for Politics. The party infighting, Sabato said, is "absolutely expected." "Where you stand depends on where you sit in American government. So to me, it's par for the course. It always seems more dramatic and important at the time from the perspective of history," he added. The first nine months of the Obama administration have put to rest any Republican fears of a rubber-stamp Congress. That point was made painfully clear earlier this month in a "Saturday Night Live" sketch chastising Obama for the unfulfilled items on his to-do list. Democratic strategist Phil Noble says the tug-of-war among Democrats is just the nature of the party, pointing to a quote by Will Rogers, who said, "I'm not a member of any organized party, I'm a Democrat." "We are not an authoritarian party. We don't have the tradition of rigid party discipline that Republicans have had," said Noble, who is president of the South Carolina New Democrats. Relatively speaking, the divisions among the party are minor, he added. "A lot of people have short memories. I don't think we are particularly divided at all as compared to ... what happened with the Democratic Party over Vietnam, over civil rights, over big issues -- and Obama is trying to do big things." As for now, the Obama administration is just working out its rhythm with Congress. "They're just going through the process -- they haven't figured out totally which hands to hold and which arms to twist yet, and I think they will," Noble said. Ron Bonjean, a Republican strategist who was press secretary for Senate Minority Leader Trent Lott and was communications director for House Speaker Dennis Hastert, says majority control is not always the blessing that it might seem. "It was very challenging to put together legislation, to get a consensus on legislation," he said of his work in Congress during Republicans' one-party rule. Health care reform for Obama is much like Social Security reform was for the Bush administration, he said, recalling the tough time the Republican leadership had convincing party members that it was the right thing to do. Another problem with majority rule: There's no one else to blame. If Republicans controlled one of the chambers, Democrats could accuse them of slowing things down, but instead, "they have no one to blame but themselves for not getting this done," Bonjean said. Sabato says Democrats will be fine as long as they get something "reasonably satisfactory" done on health care, but if the party bickering brings negotiations to a halt, Democrats could see ramifications in the 2010 midterm elections. "Republicans are going to pick up seats regardless -- that's the norm in a midterm election, but it's a question of how many seats. It can be a handful or it could be lot. And the Democrats can affect whether it's a handful or a lot," he said. But Bonjean says the divisions are a huge drag for Obama, "because these are his foot soldiers on Capitol Hill." "When they start shooting each other instead of winning, then it only makes him look bad," he said, adding that the 2010 elections will be seen as a test for Obama and a measure of his chances in 2012. But Noble says 2010 is still a long time away, and, considering the task at hand, the situation could be much worse. "[Obama's] trying to do big, hard things, and he's trying to do it all at once. ... Obama is trying to make transformational changes. He's trying to pass health care. He's trying to do stuff that Democrats haven't been able to get done since Harry Truman," he added. "For there not to be knives drawn, fistfights in the streets, is pretty damn good."